ပံု ၆-၆၉ Vane axial fans in parallel and double width centrifugal fans in parallel. 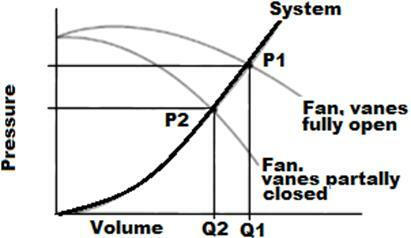 The parameter used by ASME to define fans, blowers and compressors is__________. 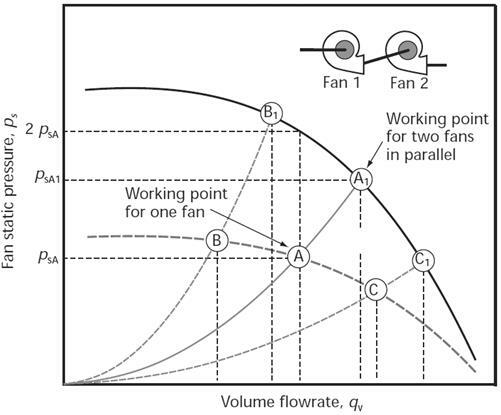 Which of the following axial fan types is most efficient? 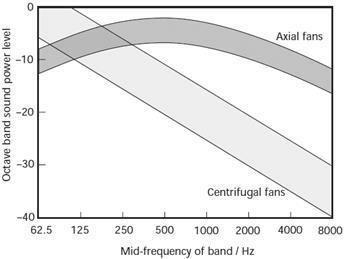 Which of the following is not a centrifugal fan type? 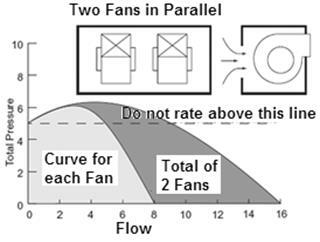 Match the following for centrifugal fan types. Name the fan which is more suitable for high pressure application? Axial fans are best suitable for _________________ application. The clearance required for efficient operation of impeller of 1 meter plus diameter in Radial type fans is ___________. 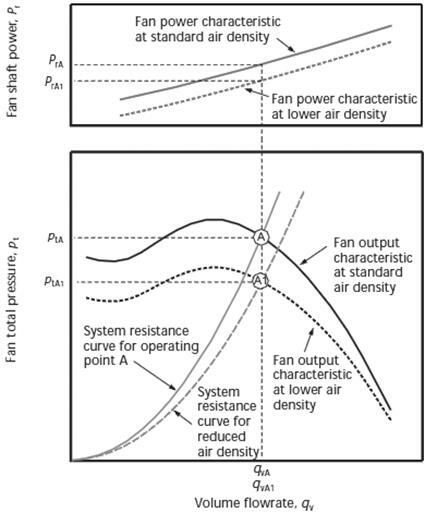 Which type of control gives maximum benefits for fan application from energy saving point of view? The pressure along the line of the flow that results from the air flowing through the duct is ______________. The outer tube of the pitot tube is used to measure __________________. Axial-flow fans are equipped with ________________. The density of a gas at a temperature of 50 deg. C at site condition is _____________. 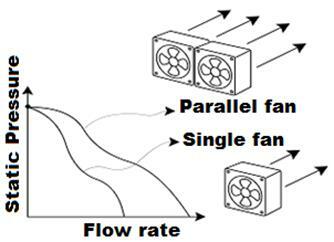 In centrifugal fans, pressure is developed due to the centrifugal force imparted to air, unlike axial flow fans where velocity energy is imparted to air, which in turn is converted to pressure energy at the fan outlet. Centrifugal fans are suitable for high pressure applications as compared to axial flow fans. 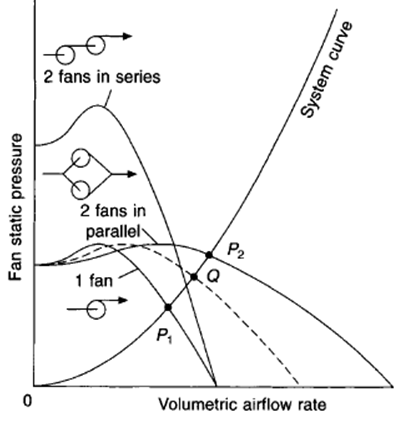 Under which conditions of pressure ratios and volumes, low speed fans are preferred? 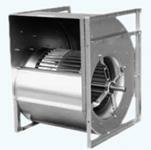 Low speed fans are preferred for low pressure ratios and large volumes. 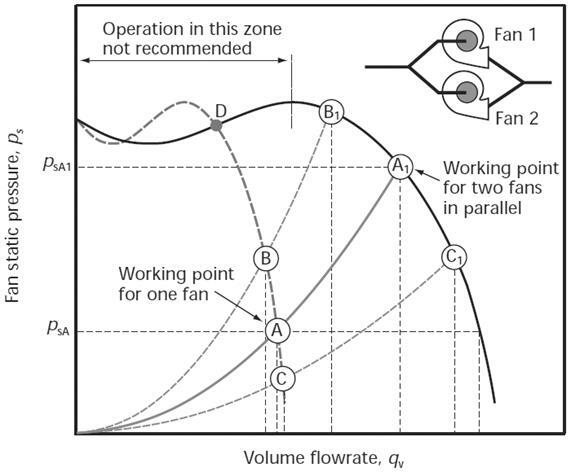 A very conservative approach is adopted allocating large safety margins, resulting in oversized fans, which operate at flow rates much below their design values and consequently which leads to operate at very poor efficiency. Radial, forward curved and backward inclined fans. 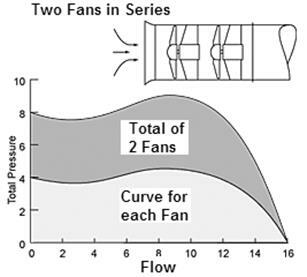 Forward curved fans have the advantage of lower shut off power, which is desirable for low flow rate operation. a. Changing pulley ratio for drive and driven equipments. b. Variable frequency drive variable speed fluid coupling. 1. Change of impeller by a high efficiency impeller along with cone. 6. 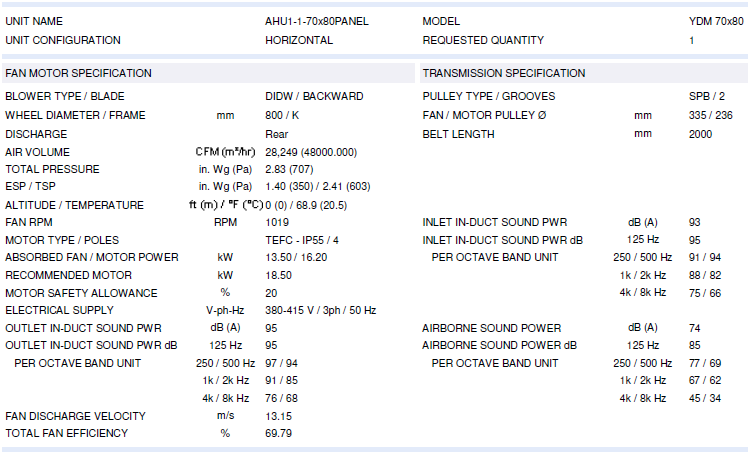 Option of energy efficient flat belts, or, cogged raw edged V belts, in place of conventional V belt systems, for reducing transmission losses. 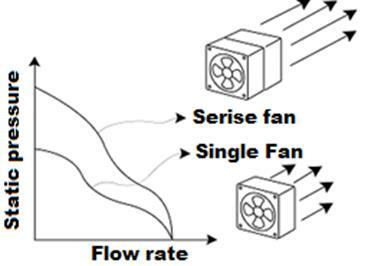 The flow is varied in accordance with the process requirement by changing the speed of the fan. 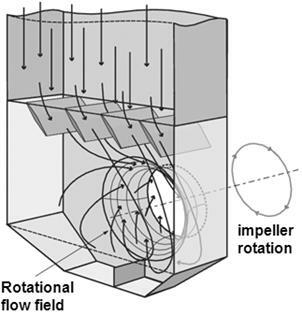 The flow is varied by guiding the inlet air into the fan in the direction of impeller rotation in accordance with the process requirement. 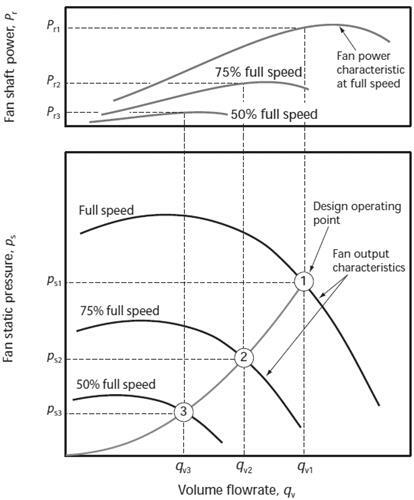 The main factors affecting the performance of fans are flow, pressure, temperature, speed and damper positions on the fan side and the power input in KW on the motor side. Radial type of centrifugal fans is used at high pressure, medium flow conditions. Example. Dust laden, moist air/gas in textile industry. 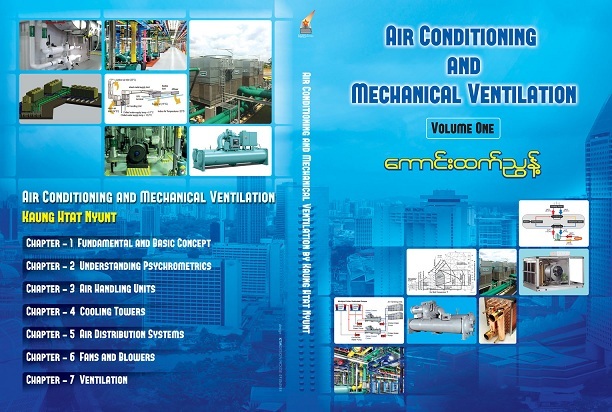 Inlet guide vane control is one type of capacity control of fans. The inlet guide vanes are designed to guide the inlet air into the fan in the direction of impeller rotation and, therefore, improve performance, resulting in somewhat better energy efficiency than damper controlled operation. 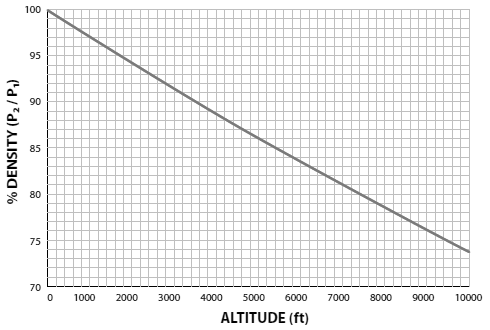 Gas density = (273 x 1.29)/(273 + t°C). 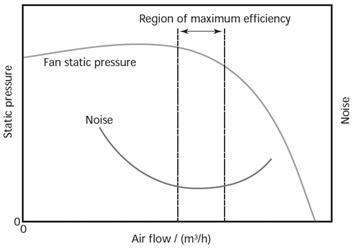 Density of gas is important consideration, since it affects both volume flow-rate and capacity of the fan to develop pressure. 1. Ambient temperatures, both the minimum and maximum are to be specified to the supplier. This affects the choice of the material of construction of the impeller. 2. 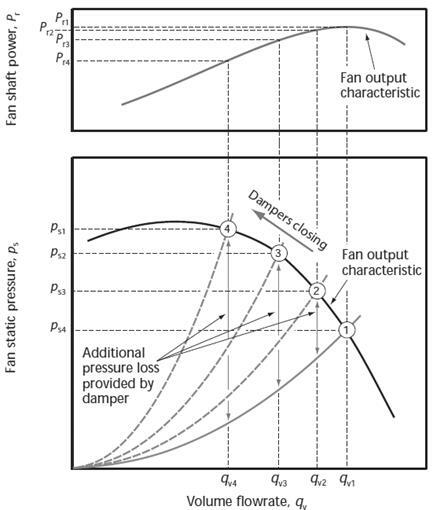 Density of gas at different temperatures at fan outlet has to be considered while designing the fan. The volume of the gas to be handled by the fan depends on temperature. Protected against solid objects over 50mm e.g. hands, large tools. Protected against solid objects over 12.5mm e.g. hands, large tools. Protected against solid objects over 2.5mm e.g. wire, small tools. Protected against sprays of water from any direction, even if the case is disposed up to 60from vertical. Protected against solid objects over 1.0mm e.g. wires.